Our recent eastern Canada road trip from Montreal, Quebec to North Sydney, Nova Scotia was one heck of a ride. With icy roads, below freezing temperatures, and long, windy highways, the drive was part of the adventure. 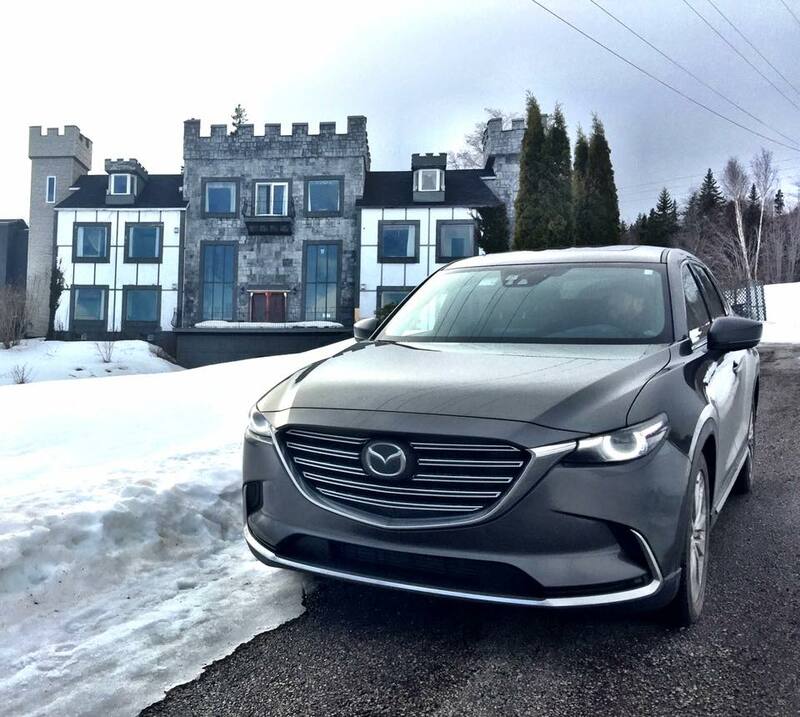 Luckily, we had the Mazda CX9 to get us there safely. Follow along on our 6,000 km journey into a wintery Eastern Canada. 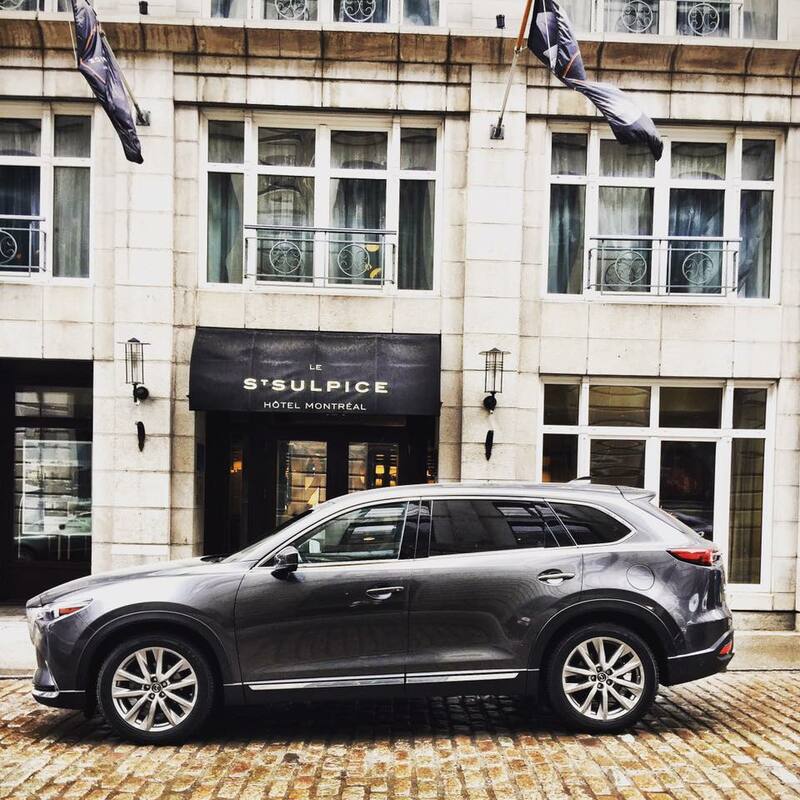 Our adventure began at Le St. Sulpice Hotel in Old Montreal. Parking can be difficult in the old cobblestone streets so we opted for valet service at the hotel. It was in a prime location for walking and discovery the area so our wheels weren’t need for the first two days. 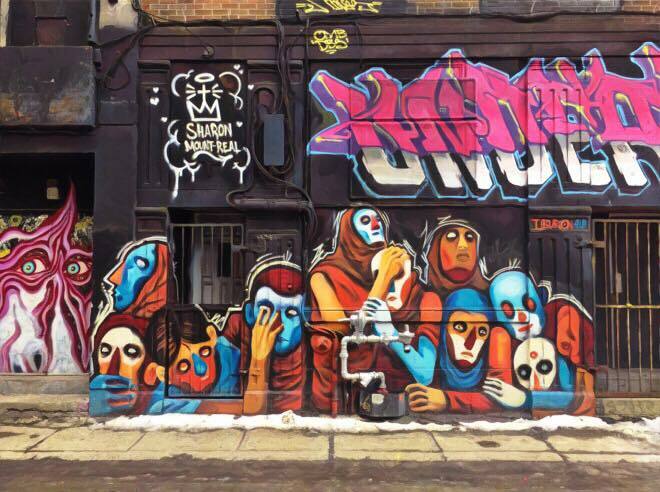 On the colder days, we decided to drive around the side streets and search for unique street art. There’s tons of it in Montreal. It was like visiting an art museum without stepping foot out of the SUV. One of my favorites was this haunting piece that was overlooked by a creepy baboon. 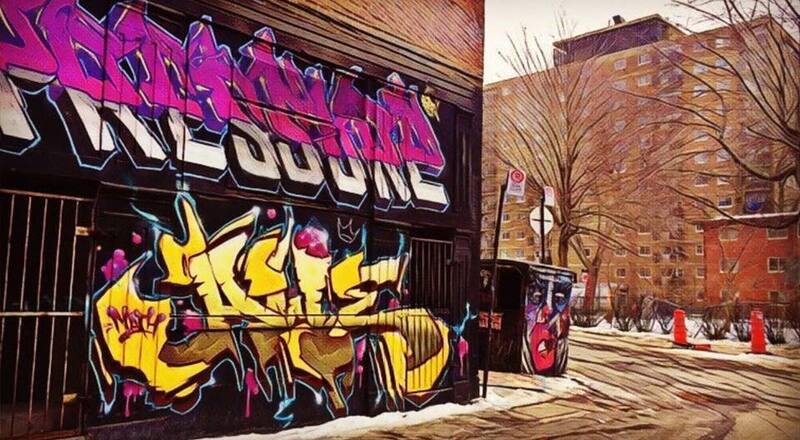 I feel like spray painting to vandalize is discouraged when there is art like this all over the city. It was rare to see typical tagging graffiti, especially in areas with art like this. After visiting multiple museums, tasting delicious food, hiking, skating, and searching for the best vista points in the city, it was time to depart Montreal and head east. 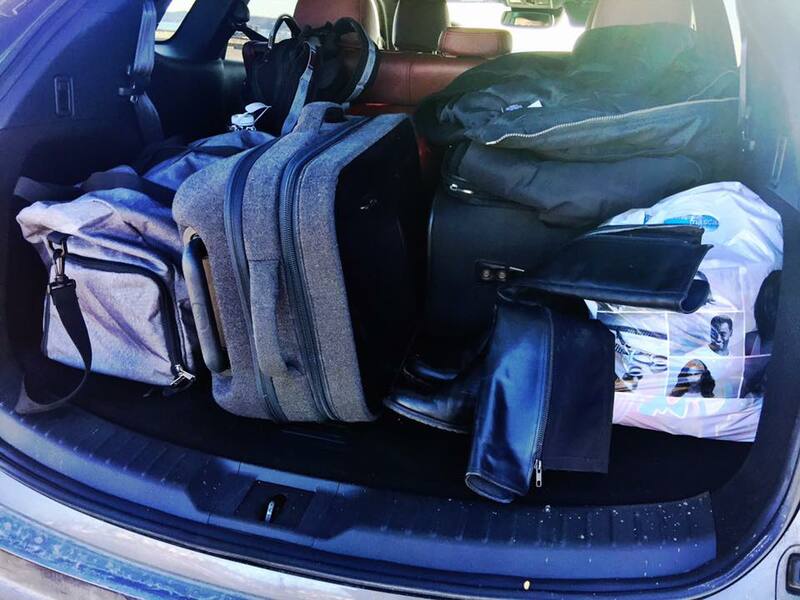 Since it was just Athena, Cord, and I in the CX9, we folded down the third row of seating to pack the bags. The seats fold down into the floor and the process is the easiest I’ve experienced yet. You don’t need to pull four different levers in a certain order like a puzzle. It’s just pull and turn and tada; the seats are down. The middle row also folds into the floor if you need extra storage space but we needed the seating more. One of the main reasons I didn’t buy an SUV four years ago when I bought my van was because I couldn’t find one that all of the seats folded into the floor. Now that it exists with the CX9, I see no reason to have a van anymore. We fit three suitcases, two backpacks, two duffel bags, boots, and two shopping bags into the space and it didn’t even fill the floor. Our view wasn’t obstructed and Athena still had the entire row of seating to herself. We set the navigation system and hit the road early. Cord did most of the driving and fell in love with two of the driving features: Active Driving Display and Mazda Radar Cruise Control. 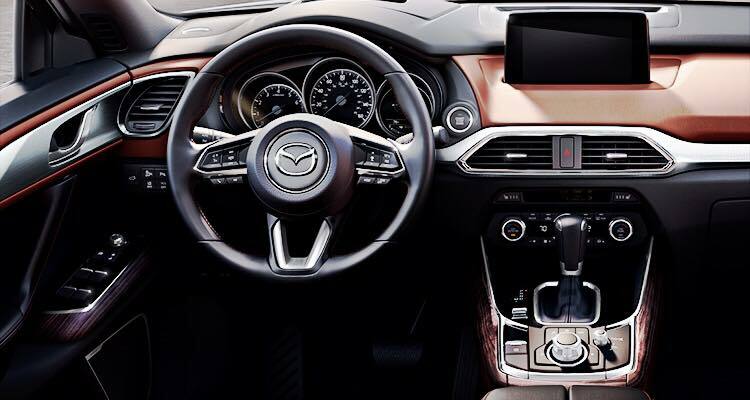 Mazda’s Active Driving Display places a wealth of useful information directly in your line of sight. We could keep our attention focused on traffic, while simultaneously monitoring speed, turn-by-turn navigational instructions, and notifications from the advanced driver’s assistance features. Mazda Radar Cruise Control (MRCC) uses a millimeter wave radar to judge the relative speed and distance to the car ahead and automatically controls vehicle speed. Once we were on the highway, which was the better part of the drive, Cord set the cruise control to the speed limit and he didn’t need to worry about cars slowing down in front of him or adjusting our speed. If we approached a car that was going slower than we were, the MRCC would automatically adjust our speed to maintain a safe following distance. It’s the perfect combination of safety and convenience. Over 10 hours later, we arrived in Moncton, New Brunswick, our next stopping point. 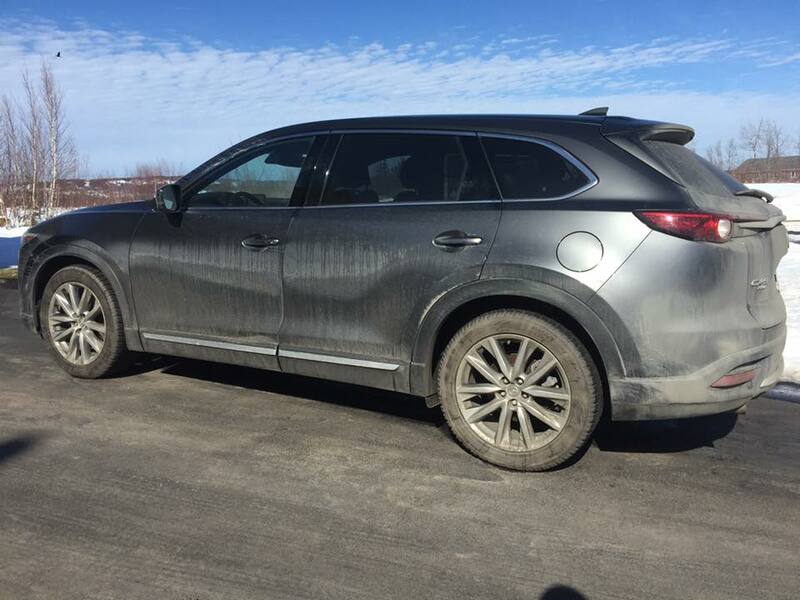 The CX9 was filthy! It’s not like driving in California where you could drive for months without washing your car and it still looks clean. The slush, snow, and salt do a number on vehicles in eastern Canada. It may have been dirty, but we felt safe the entire drive. The snowbanks in New Brunswick were over our heads, making visibility extremely poor. The rear view camera helped with monitoring traffic and obstructions that were difficult to see over and around the snow. 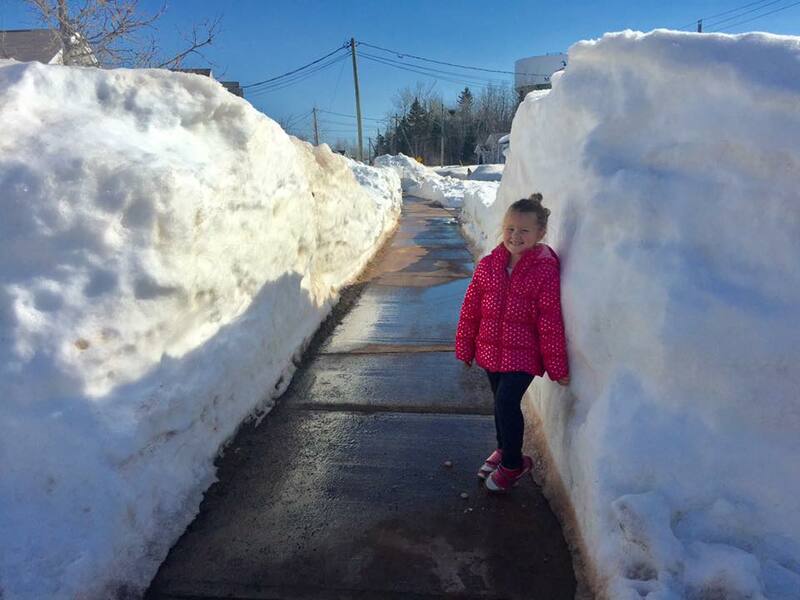 Even with the camera, we still had to use caution with snowbanks of this size but we were happy with the added support. Moncton was a stopping point because my brother and his family live there. We spent three days with them before continuing even further east to Cape Breton, Nova Scotia. Cape Breton was my home for over twenty years and my grandparents still live in Sydney Mines. 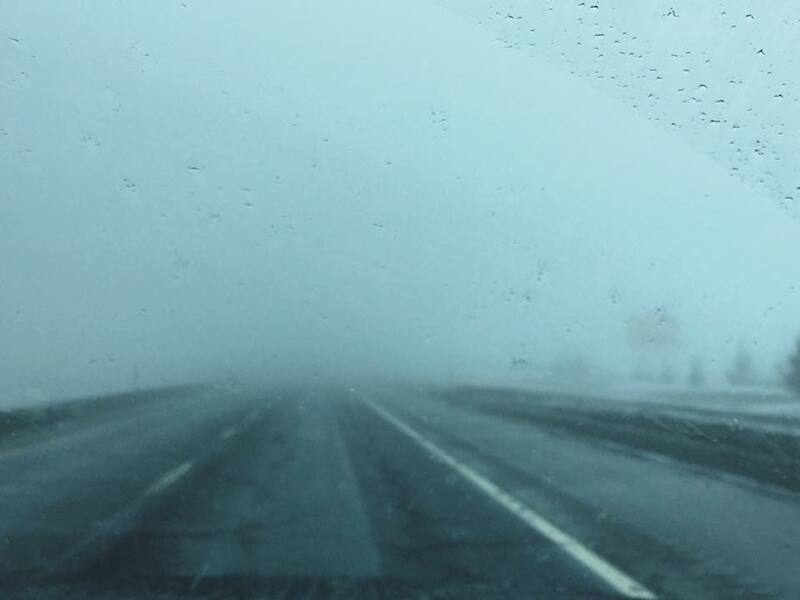 It’s literally the end of the road when it comes to driving in eastern Canada. If you want to go any further east, you’ll need to get a ferry to Newfoundland. We appreciated the all-wheel-drive system on the steep hill leading to the castle. It’s fully-autonomous so we didn’t need to stop and engage it before starting up the hill or heading back down. We stopped for a few photos and Athena got out to play in the snow. I think there are new owners of the castle but they didn’t mind us taking a few shots before continuing on our way. The owner came out to say hello and said we could stay as long as we’d like. Our next stop was Sydney Mines. I’ve traveled a lot of the world and lived in many countries but Sydney Mines will always be my home. I never have enough time with my grandparents, but the time that is spent there is always filled with joy, love, and laughter. The journey back to Montreal wasn’t as sunny and bright, and the inclement weather made it even more dreary. Mazda’s rain-sensing wipers came in handy during this part of the drive. They automatically activate when rain begins to accumulate on your windshield. In addition to improving visibility, it helped keep our eyes on traffic, rather than looking down to activate the wipers. It finally stopped raining and snowing when we arrived in Montreal, but we were tired from driving and focusing on the road after hours and hours of limited viability. 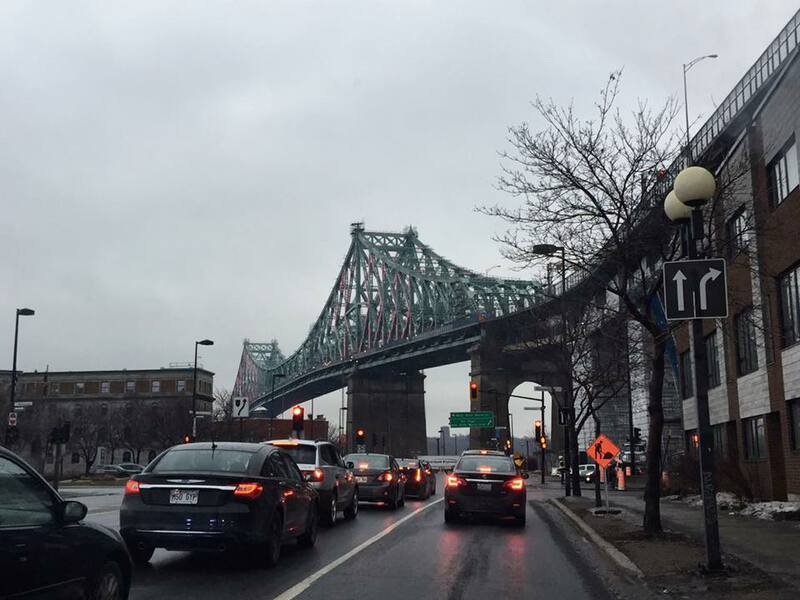 Although we love Montreal and we’re even considering moving there, driving in the city is a nightmare. It might be the worst traffic in all of eastern Canada. We don’t know our way around and with construction everywhere, the navigation system isn’t as helpful as we’d like. We never had to use it, but knowing that we had Smart City Brake Support gave us comfort. Low-speed rear-end collisions are one of the most common type of accident. With Mazda’s Smart City Brake Support, the car can stop itself at speeds below 20 miles per hour if the system senses a collision is imminent and the driver fails to take action. City driving can be the most stressful so added features like Smart City Brake Support don’t fall short. Our eastern Canada Road Trip brought us from Quebec to New Brunswick and Nova Scotia and back again. We drove through rain and snow, during the day and night, and manged to do it safely and in comfort. It’s time for a vehicle upgrade for my family. 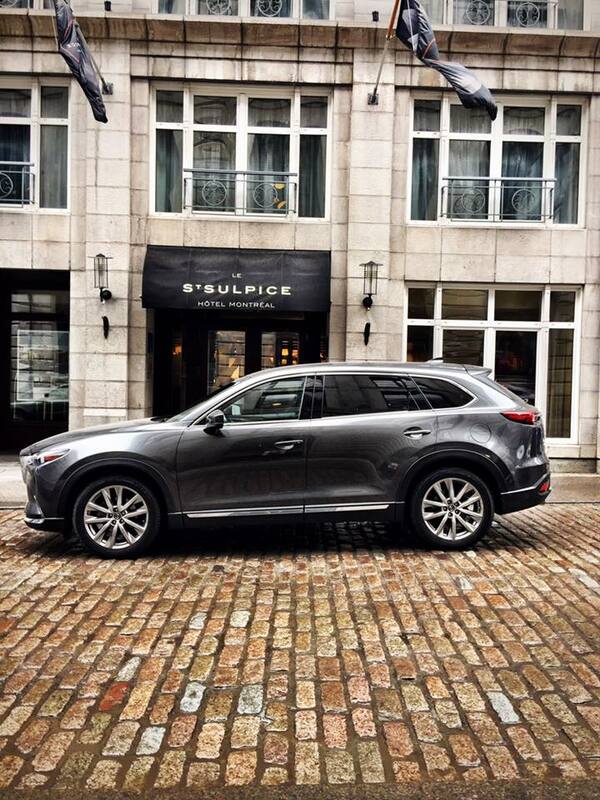 The only feature keeping me in a mini-van was the folding seats, and now the Mazda CX9 even has that. 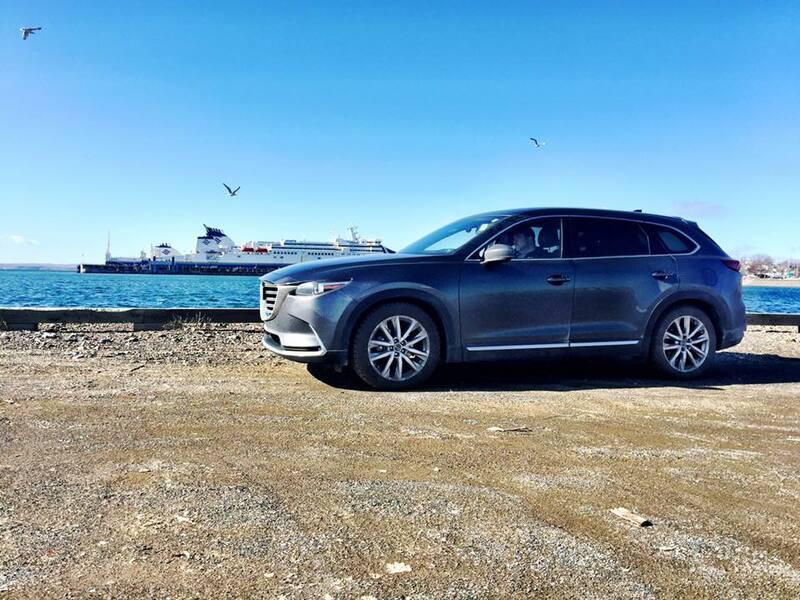 With seating for 7, endless safety features, all-wheel-drive, and a stylish look, the CX9 is a front runner for my next vehicle.